There’s always a ton of pressure during the first two days of tournament play. The years full of shocking upsets and buzzer-beaters have spoiled us. We expect that every year on the first Thursday and Friday of tournament play. When a day like this Thursday comes along, you’ll hear some complaining the action didn’t quite reach chaotic levels. Even without the wildest surprise upsets or heroic game-winners, we saw 16 basketball games, all of which taught us something about this tournament and the teams in it. We also saw a ton of close calls, one-possession games, and some mind-boggling performances. Here’s what we learned from the action. 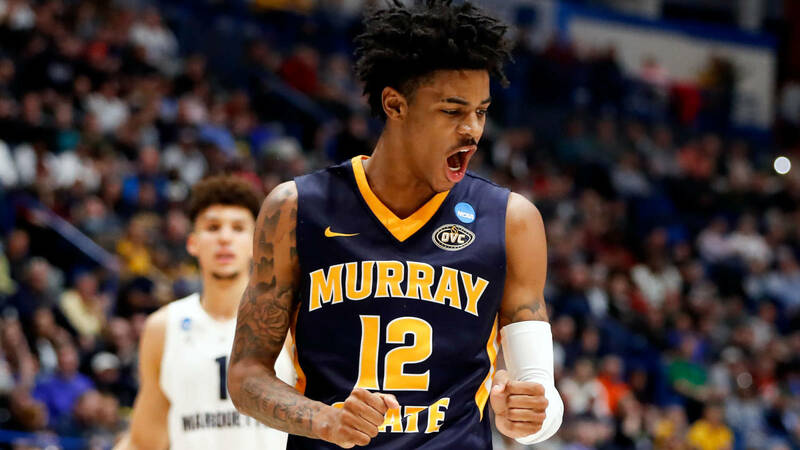 Until March, Ja Morant received more attention as an NBA Draft prospect than as a college star. He was ready for the spotlight Thursday, leading Murray State to a blowout over Marquette. Morant recorded the 17th triple-double in NCAA Tournament history and the first since Draymond Green in 2012. Morant drew attention for a monster two-handed flush in the second half, but the real story was how well he played all over the floor against a strong high-major team. Morant finished with 17 points, 11 rebounds and 16 assists, playing great defense and essentially controlling the pace of the game. It was the best performance of the day. The first game of Thursday’s action provided our first surprise as Minnesota beat Louisville handily. Richard Pitino had his team ready to play against the school that fired his father a year ago. Every Gopher in the starting lineup provided double-figure scoring and, as a team, Minnesota turned the ball over just five times. The Golden Gophers had been stumbling toward the end of the Big Ten schedule, putting themselves directly on the bubble. They earned their bid to the tournament by beating Purdue twice in a 10-day span. In recent weeks, this team has look renewed. Now they’ll get a crack at Big Ten rival Michigan State, which Minnesota played once this season, an easy Spartans victory in East Lansing. The afternoon saw three low seeds give top dogs a real test before fading late. Bradley was the most notable, pushing second-seeded Michigan State to the brink. The Braves led with under seven minutes to play before an 8-0 Spartans run changed the outlook of the game. Bradley benefited from hot shooting in the first half but simply didn’t have an answer for Cassius Winston or Michigan State’s size. Vermont also fought late into the second half, courtesy of some sharp shooting, making 16 of 32 from beyond the arc against Florida State. Despite making enough long balls to stay competitive, the Catamounts could not contend with the Florida State frontline. America East Player of the Year Anthony Lamb was overmatched by the Seminoles size and shot just 4 of 13 from the field. On the opposite end of the spectrum, Yale was able to handle the size and speed of a high-major opponent, yet forgot to pack their jump shooting on the flight out of New Haven. The Bulldogs, a strong outside shooting team this season, managed to shoot just 8 for 37 from outside the arc, with many of the makes coming too late to matter. Yale’s best player, Miye Oni, failed to score in double figures for just the second time this season, shooting a miserable 2 for 16 from the field. Oni made just one of his 10 long-range attempts as the Bulldogs failed to keep pace with LSU. Two of the day’s better opportunities for an upset were foiled by questionable decision-making down the stretch. New Mexico State cut into an Auburn lead, giving itself a chance to tie the game late. The Aggies trailed by two in the final seconds. AJ Harris split through the defense in the paint but passed up a chance to finish at the rim for a wild hook pass out to the perimeter. Auburn bailed Harris out by fouling Terrell Brown as he attempted a 3-pointer. Although Brown missed two of three from the line, the Aggies had yet another chance as the third free throw bounced off of an Auburn player and out of bounds. The Aggies inbounded to Trevelin Queen, who air-balled the potential game-winner. New Mexico State had ample chances and time after time didn’t take advantage. Belmont had a double-digit lead in the first half but saw that disappear late. The Bruins had possession, down by one point, with under 20 seconds to play. Inexplicably, Belmont chose to hold the ball for the final shot to win the game. The Bruins’ possession ended with a backdoor pass being stolen. By the time Belmont could foul, less than three seconds remain. With no timeouts, Belmont’s last gasp came from beyond half-court. Unlike Michigan State, other top seeds had no problem running away. Both Kentucky and Gonzaga dominated both ends of the floor in easy victories. Kentucky held Abilene Christian to just 13 first-half points and 32 percent shooting for the game. Big Blue owned the glass, grabbing 44 rebounds to Abilene Christian’s 17. Keldon Johnson made up for the absence of PJ Washington by scoring 25 points. Gonzaga was just as impressive, ripping off a 19-0 run before the half. The Zags recorded 22 assists on their 34 field goals, sharing the ball to find scoring chances. Gonzaga’s lead ballooned above 40 as Fairleigh Dickinson struggled to score against the Bulldog defense. The Knights shot just 15 for 50 from the field. No team saw as much drama and adversity as Kansas did this year. Bill Self lost players to injuries, personal reasons and NCAA suspensions. The Jayhawks did not win the Big XII regular-season title for the first time in 14 years and were blown out in the Big XII Tournament final in front of a pro-Iowa State crowd in Kansas City. It was nearly impossible to calibrate tournament expectations for this team. Kansas came out against a Northeastern team which could have presented problems and soundly defeated the Huskies. Northeastern fell behind early and was never able to keep pace with this rebuilt Kansas club. Dedric Lawson played like an All-American, and Devon Dotson has stepped to become a legitimate star. If Kansas plays like it did on Thursday, the Jayhawks will be a tough out moving forward. In a matchup of two similarly skilled teams, the Florida Gators upended a talented Nevada team. The game pitted two teams with radically different paths to the tournament. Florida needed to upset LSU in the SEC Tournament just to get off the bubble and into the field, with a record of 19-15 entering the Big Dance. The Gators were aided by their strength of schedule, making up for their raw number of losses. Nevada was quite the opposite. The Wolf Pack had only four losses this season but only played three games against teams in the NCAA Tournament. The teams had also been moving in opposite directions, with Florida winning eight of 12 games and Nevada losing three times since Feb. 20. On Thursday, Nevada’s isolation heavy offense simply stalled against Florida’s defense. The Wolf Pack were forced into contested jump shots throughout the game and shot just 5 for 24 from outside the arc. Even when the game was close late, Nevada couldn’t find the answers to make shots.